Let the magical hug of Hoodieni work for you this winter and beyond! Made of Cotton Poly Mix. Long sleeves with thumbholes and Kangaroo pockets protect you from the crispy cold weather. 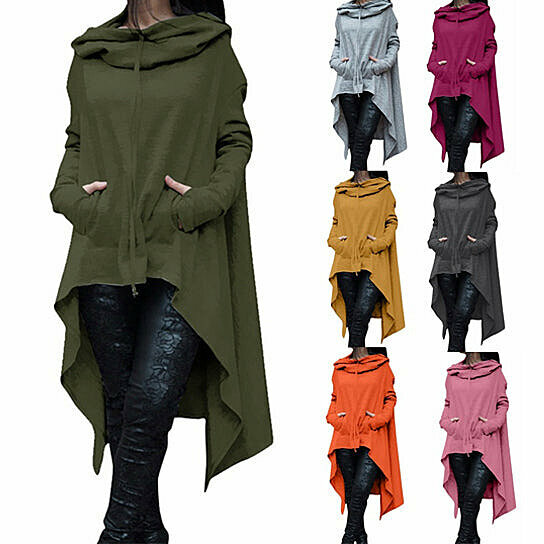 Loose relaxed fit long tail and round drawstring hood make wearing this hoodie a cozy experience. It is asymmetrical and extra long, measures approx. 50 to 65 cm Long. It comes in sizes S, M, L, XL, 2XL, and 3XL. See size chart for details. Select from cozy colors like Black, Grey, Green, Blue, Red.